National and international assessments of quantitative literacy demonstrate that U.S. students are not performing as well on measures of mathematic abilities as their peers in other countries. Given the importance of mathematics for school, employment and other aspects of daily life, policymakers, practitioners and parents have incentives to improve children’s mathematic proficiency. However, less is known about which interventions can best improve quantitative literacy. 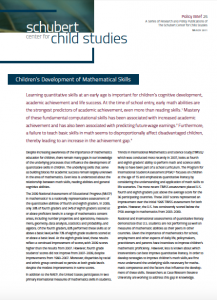 In order to develop strategies to improve children’s math skills, we first must understand the underlying skills necessary for mathematic competence and the factors that influence the development of these skills. Researchers at Case Western Reserve University are working to address this gap in knowledge. This policy brief covers the ongoing research by Dr. Lee Thompson and colleagues to address a gap in our understanding of how children develop math skills.